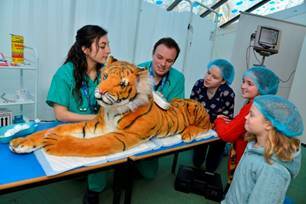 ZSL London Zoo is inviting children to become zoo vets this February half-term at Animal Hospital, an award-winning role-playing experience for budding veterinarians. From Saturday 16 to Sunday 24 February, as part of Vets in Action, kids will be able to step into the role of a vet at ZSL London Zoo, during a packed week of interactive family events celebrating their incredible work. After arriving for work at the hospital’s reception, junior vets will be prepped with hairnets and masks before joining the team in the zoo’s specially-recreated zoo vet centre. Becoming part of the action, children will help experts examine, x-ray and carry out treatments on toys, experiencing first-hand the huge variety of work carried out by the Zoo’s vets, vet nurses and zookeepers – from microchipping meerkats to removing plastic from the tummy of a sea turtle. After the masks come off, a packed schedule of demonstrations and activities throughout the week will take families further inside the exciting world of the Zoo: explaining everything the ZSL team does to keep its 18,000 residents in tip-top condition – from the cobras and crocodiles in the Reptile House to the tamanduas and three-toed sloths in Rainforest Life.